This was our first winter on Hope, our 35′ sailboat, and we’re learning that living on a sailboat in winter offers, well, of course, its share of challenges and hard-earned lessons, as well as reminders of what living in a tiny home/sailboat can teach you about enjoying the present moment. Like many parts of the U.S. this winter, the past few months have brought record-low temperatures, sometimes including zero-degree wind chills and gusts that would make anyone cry. 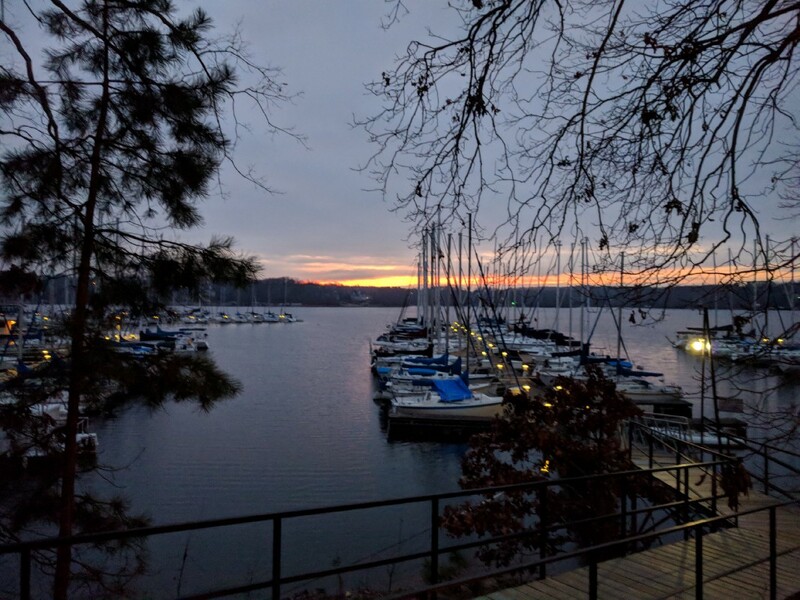 One morning in January, we woke to find 1–2 inches of snow and ice covering our boat (and we live in an area not common for snow). It was beautiful and a little deadly. The amount of water we use — for tea, coffee, washing our hands, cleaning dishes, brushing our teeth, etc. — becomes that much more apparent (in hyper relief!) 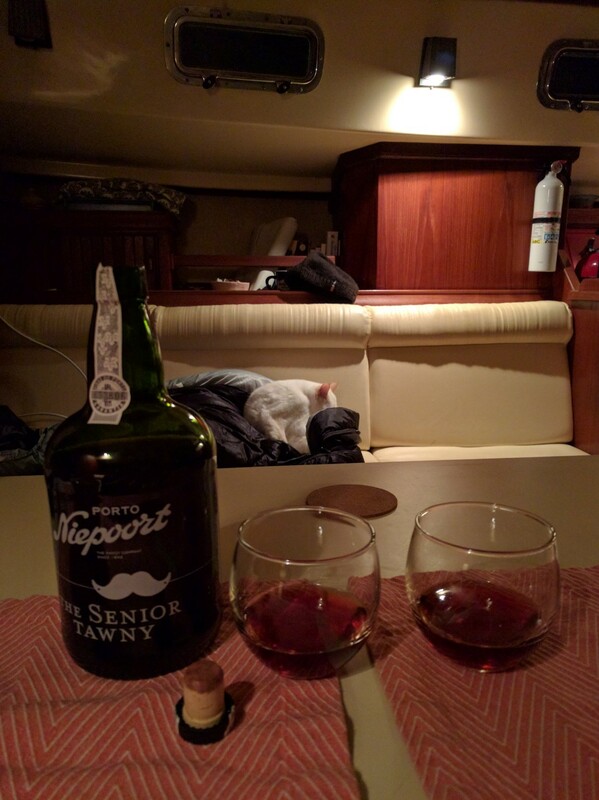 when living on a sailboat in winter. The same goes for how much trash we accumulate, how much electricity we use, which breakers we’re using for what device. And, yes, we become attuned to paying attention to how often we use the head (aka toilet). During cold weather, it’s not uncommon for the marina where we live to turn off the main water lines and hoses (used for pumping out) for fear of frozen lines. This has lasted sometimes for days —even more than a week at a time —so it became crucial to conserve our water like a mofo. It also made us appreciate the hell out of every cup of coffee. When living on a sailboat in winter, nothing connects you more with your fellow “liveaboards” as when you swap stories about how your boat — your home — is holding up during the winter weather, how well you’re staying warm, techniques for handling condensation, plans for sailing, etc. Ultimately, these chats take place on the dock, while walking the dog, over dinners, or sometimes over texts when making sure a neighbor handled a particular gusty night okay. In a world where manmade noises and stimuli are a constant distraction, where phone app notifications (even when you think you’ve turned them off!) are continually trying to get our attention, living on a sailboat in winter means we appreciate more and more how much we don’t hear in terms of traffic, sirens, and other various noises that mask what’s underneath, such as the wind howling through the cove, deer gingerly stepping through the woods up the hill, or the sound of water lapping at the sides of the hull. Hope during a previous (and lighter) snowfall this winter. Taken by Michael. We consider ourselves pretty adaptable with most things, but living on a sailboat in winter is admittedly a new level of challenge. 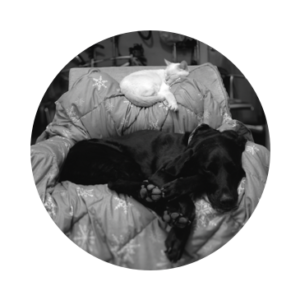 Since cold weather can keep you indoors more often than other times of the year, staying adaptable (and keeping a sense of humor) about your definition of personal space is key. For instance, the day this post was written in mid-January might’ve been the coldest day this winter. 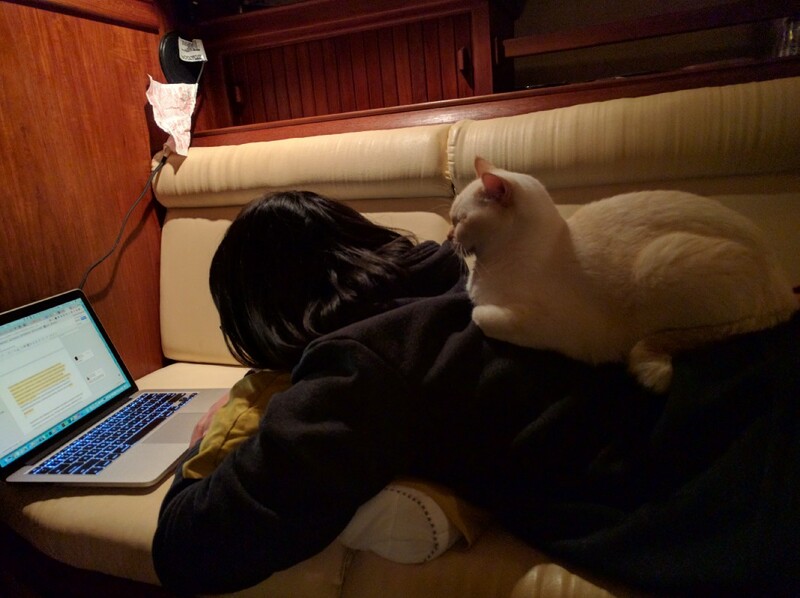 As someone who works remotely, living on a boat also means I’m living, cooking, sleeping, AND working from within our tiny home — aka a sailboat of about 150 square feet — along with my husband and our pets. Working remotely in a small space adds the heightened challenge of how to stay focused on the task or project at hand, so staying adaptable has been especially critical for myself and my husband so we can remain productive and creative. On the most challenging days when living on a sailboat in winter–like when I’m feeling cooped up because of the cold weather or feeling out of sync with my rhythm somehow, I’m reminded of how often I actually experience moments of gratitude throughout the day — while noticing my husband rapt with attention about something he’s reading, the glorious clicking sound of the propane stove when the flame heats up my water, how fresh bread tastes from our oven, the sight of our dog asleep and dreaming on her bed and the cats curled up in their favorite spots, or when turning off the lights before going to sleep and seeing a star (or a dozen) through the clear hatches above. 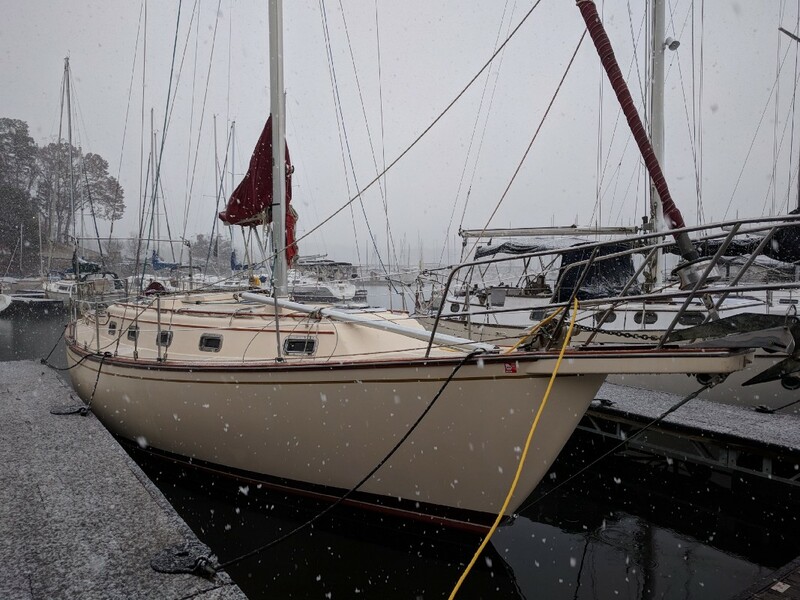 Snow and ice covering our boat is a humble reminder that, yes, Mother Nature is, indeed, in control so fighting that or worrying too much about it is futile when living on a sailboat in winter. This includes the wind, which doesn’t necessarily adhere to forecasts and sometimes — often — changes direction. And there’s also the 50+ feet of water that exists beneath us while we’re moored to the dock (we’ve only lost something once to the water due to a gusty day…hehe). 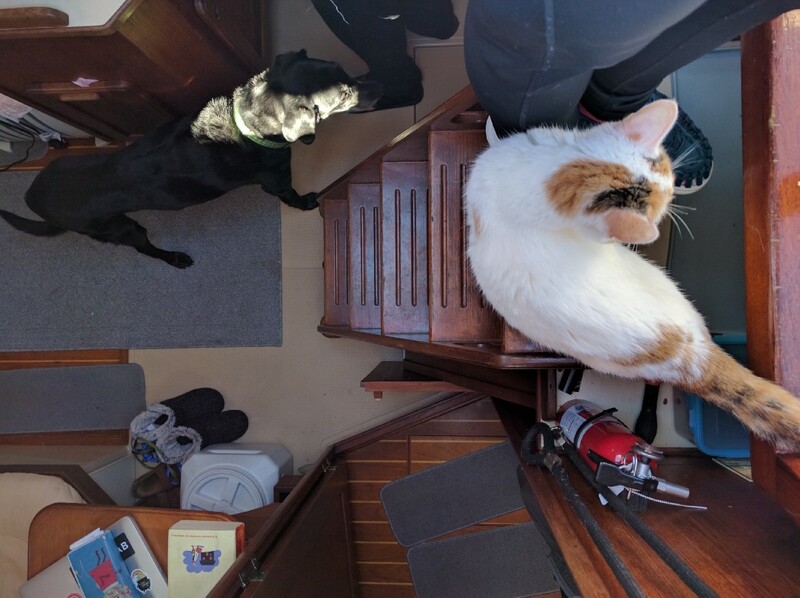 View from above our companionway taken back in the fall. As a kid, I distinctly remember feeling unexplainable heartache one day about the rabbits in my neighborhood (why, I don’t know), so much so I decided to sing out to them — like you do — in the backyard, at full volume while the rest of the neighborhood kids were playing a game of tag. This experience is pretty emblematic of how I can move through the world at times — overthinking or worrying about what’s out of my control. That said, living on a sailboat in winter is forcing me to, well, get thicker skin. I still worry about things or overanalyze, but honestly, I feel less motivation to do so most days because it’s winter and we’re living on a boat (see #1 and #4…hehe). Living on a boat during the winter helps to keep things in perspective and for staying resilient. Besides, a good sunrise (or sunset) makes up for a lot. Regardless of what kind of boat you have (e.g. on one side of us at the marina, for instance, is a boat that needs a ton of work and is for sale for less than the price of a new laptop vs. another neighboring boat that easily put the owner back a good six figures), the playing field equalizes a bit when folks are living on a sailboat in winter and just making sure their basic needs for warmth and electricity are being met, and that their boat is safe. Because only port (or bourbon) will do on a cold night. When stepping out of the cockpit and being greeted by a layer of ice and snow, or when climbing down the companionway stairs (which are steeper than regular stairs), I focus on taking those steps with more care for safety’s sake while not thinking about much else. As you can imagine, living on a sailboat in winter means there’s no texting while walking (something I used to do a lot) if you’re on the dock or on a boat, especially when there is snow or ice involved. Paying attention to what I’m doing at a given time (and tuning out the white noise of the day) takes on more meaning when it’s without the illusion of “multi-tasking” or feeling distracted.